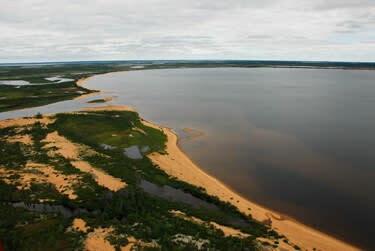 Caribou River Provincial Park was established in 1995, and is located in the north east portion of Manitoba along the Manitoba/ Nunavut border. The park is 7,640 km2 and is characterized by the Caribou River system. This wild and pristine waterway is marked by rapids and waterfalls and is only accessible by aircraft or an extended canoe or snowmobile trip. The park landscape is a transition between the boreal forest and tundra regions. Permafrost restricts the growth of trees, while eskers and ancient glacial beach ridges dominate the landscape. The park is designated for wilderness camping; there are no designated campsites and visitors are asked to camp at locations that show signs of previous use, usually marked by a primitive fire ring. Address: Division No. 23 ., MB .